I spend most of my time working on the computer and this time of year that means my wrists and fingers end up painfully cold. I've tried wearing gloves but they make it hard to type. 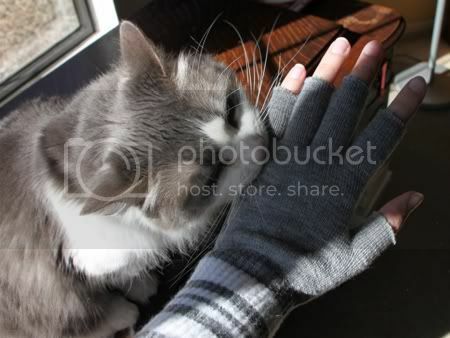 I bought fingerless bike gloves but they only covered a tiny bit of my fingers and none of my wrist. 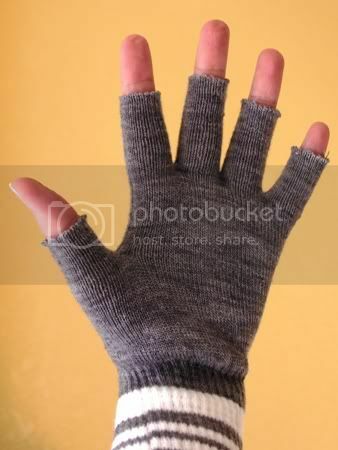 At the store today I saw a cheap pair of knit gloves with long wrists, So I bought them and decided to cut the fingertips off. 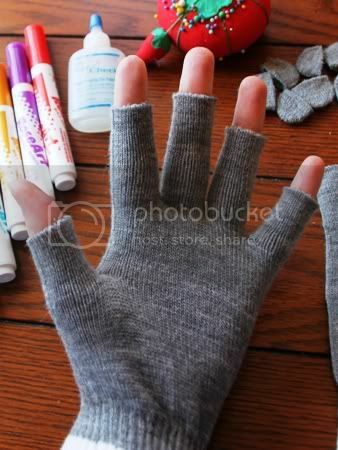 This way they would keep my hands and fingers warm but would still allow me to type easily. 1. 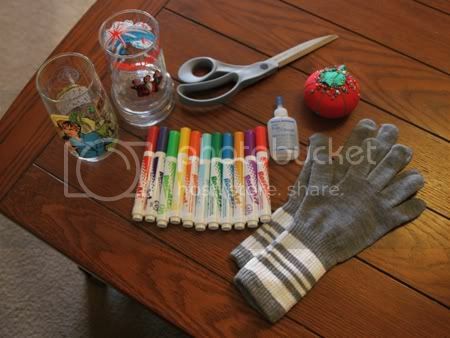 I put on the gloves and marked with pins where I wanted to cut them. 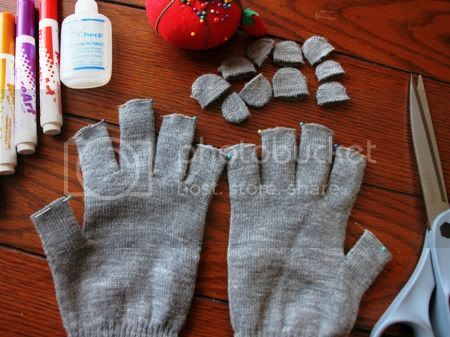 Since knit gloves are stretchy, always cut off less than you think you should. I marked them about a quarter inch above the top joint in each finger and after I cut them and tried them on again, they ended below that joint. If I could do it over again, I'd just cut off the very tip. Remember, you can always cut off more but you can't put back what you've already cut off. 2. 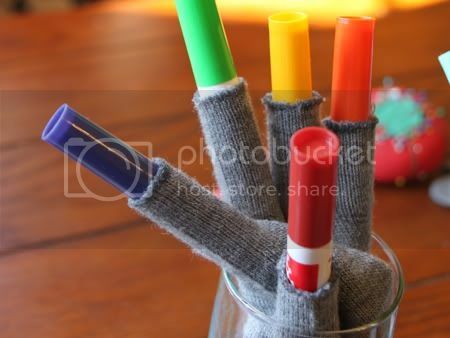 I took off the gloves (carefully so didn't get poked by the pins). 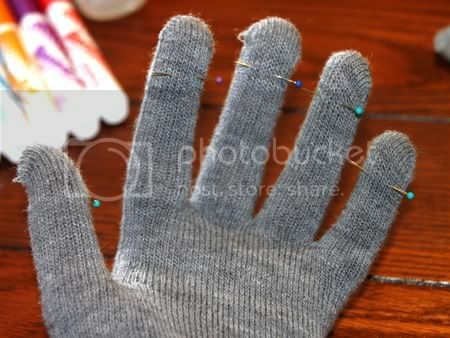 Using sharp scissors, I cut off each finger tip of the glove above the pin. 3. I took out the pins and tried on the gloves to make sure I didn't need to cut off more. 4. 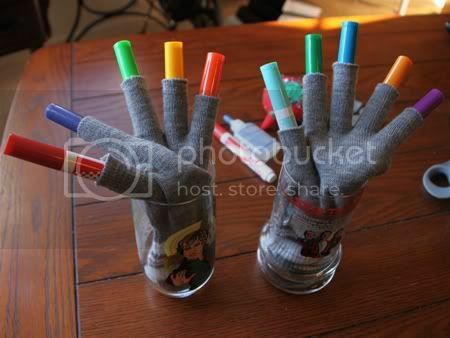 I stuck a marker in each finger then put each glove in a glass and arranged them so the fingers weren't touching. 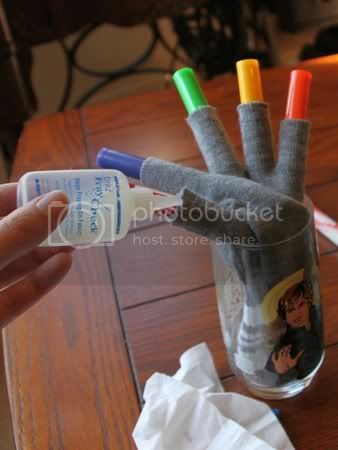 This is so the fingers won't stick together when I put the Fray Check on them. 5. I put Fray Check on each cut edge. It doesn't take a lot, but the fabric should be saturated. Looking around the web, lots of people recommend different things for finishing the raw edges: fabric glue, regular glue, even Shoe Goo! I already had Fray Check so that's what I ended up using. It does end up being a little stiff when it dries but it will soften with wear.